Welcome to the Top 16 of YCS Pasadena! In this round, we have Brian Ramirez from Moreno Valley, California Dueling against Blair Hunter from Warner Robins, Georgia at the Feature Match table! Ramirez is the last Cyber Dragon Duelist left in the tournament. He had an impressive showing in the Swiss Rounds. He finished the Swiss Rounds with a 9-2 record, and even won a Feature Match in Round 5 yesterday. Now, he’s up against Blair Hunter and his Thunder Dragons! Thunder Dragon Decks often rely on sticking Thunder Dragon Colossus or Thunder Dragon Titan on the field, and Ramirez’s Cyber Dragon cards can easily take care of monsters Summoned from the Extra Deck thanks to Chimeratech Megafleet Dragon. Will that make this a tough Match for Hunter? We’re about to find out. It’s time to Duel! Ramirez chose to go first and opened up with Machine Duplication, Cyber Emergency, Cyber Dragon Core, and 2 copies of Cyber Dragon Herz. He Normal Summoned Cyber Dragon Core and used its effect to add Cyber Repair Plant from his Deck to his hand. Then he activated Machine Duplication! 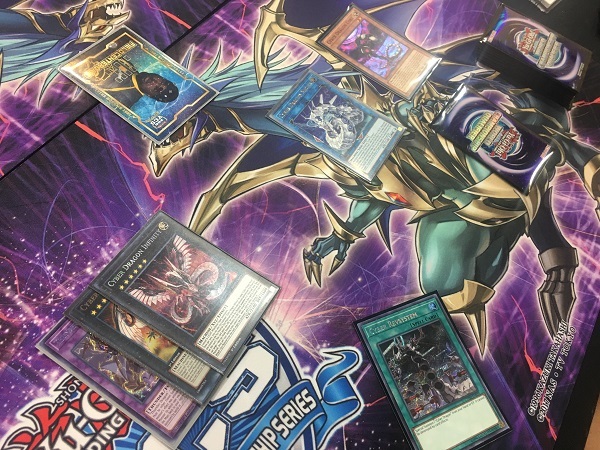 He Special Summoned 2 copies of Cyber Dragon from his Deck and then sent a Cyber Dragon and a Cyber Dragon Core to the Graveyard to Link Summon Cyber Dragon Sieger. He activated Cyber Repair Plant next, adding Galaxy Soldier to his hand. He discarded Herz to Special Summon Galaxy Soldier in Defense Position and used the Soldier’s effect to add another Galaxy Soldier from his Deck to his hand. He used Herz’s effect to add a Cyber Dragon to his hand. Then, he combined Sieger with Cyber Dragon to Link Summon Summon Sorceress, and used Sorceress’s effect to Special Summon another Galaxy Soldier from his Deck. He combined the 2 Soldiers to Xyz Summon Cyber Dragon Nova, and then used Nova’s effect to Special Summon Sieger from his Graveyard. He then Special Summoned another Galaxy Soldier from his hand by discarding Cyber Dragon and combined Cyber Dragon with Sorceress to Link Summon Knightmare Gryphon, co-Linked to Sieger. He discarded Herz to Set Cyber Repair Plant from his Graveyard and drew Infinite Impermanence off of Gryphon’s effect. He then Xyz Summoned Cyber Dragon Infinity over Nova, Set the Impermanence, and passed his turn. Hunter activated Gold Sarcophagus to banish Thunder Dragonroar from his Deck. He used its effect to Special Summon Thunder Dragondark from his Deck in Defense Position and then activated Allure of Darkness to draw 2 cards and banish Thunder Dragondark from his hand. Next, he discarded Thunder Dragonhawk from his hand to activate its effect and Special Summon a banished Thunder Dragonroar. 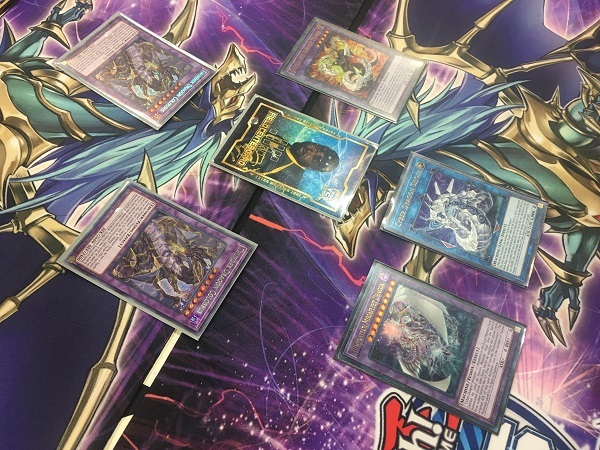 He sent his 2 monsters to the Graveyard so that he could Link Summon Some Summer Summoner and then used his Dragondark’s effect to try to search his Deck for a Thunder Dragon card; but Ramirez detached an Xyz Material from Cyber Dragon Infinity to negate it! Hunter activated Double Evolution Pill next. 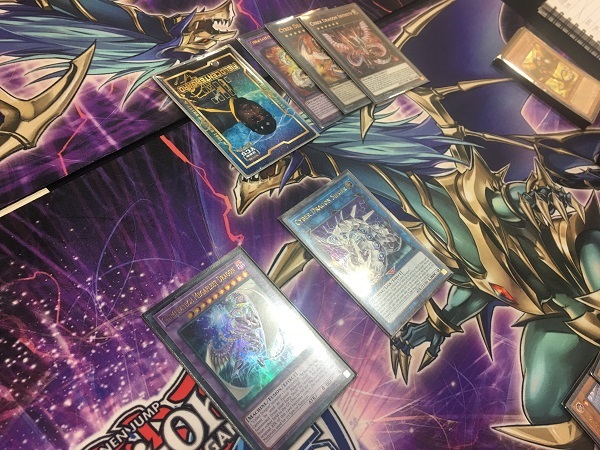 He banished Dragonhawk from his Graveyard and Overtex Qoatlus from his hand to Special Summon Ultimate Conductor Tyranno from his Deck and then sent Some Summer Summoner to the Graveyard to Special Summon Thunder Dragon Colossus from his Extra Deck! He entered his Battle Phase and attacked Knightmare Gryphon with Ultimate Conductor Tyranno, destroying it in battle and inflicting 1000 points of damage to Ramirez. Next, he attacked Sieger with Colossus, and Sieger’s effect was activated to double its ATK so that it’d win the battle. Hunter banished Some Summer Summoner from his Graveyard to protect Colossus with its effect, and Ramirez flipped Infinite Impermanence to avoid having to deal with another attack from Ultimate Conductor Tyranno. Ramirez drew Jizukiru, the Star Destroying Kaiju and then Tributed Hunter’s Tyranno to Summon it to his field. Next, he used Infinity’s effect to absorb Colossus as an Xyz Material, and activated Cyber Emergency to add Cyber Dragon Core to his hand. He Summoned it and used its effect to add Cyber Revsystem to his hand. That was enough to prompt the concession from Hunter! An awesome opening for Brian Ramirez allows him to take a swift victory in Duel 1! Hunter started off Duel 2 by activating Allure of Darkness to draw 2 cards from his Deck and banish Overtex Qoatlus from his hand. He Set 3 cards to his back row and then activated another Allure of Darkness. He drew 2 cards and then banished Phantom Skyblaster from his hand. He flipped his face-down Foolish Burial next, using its effect to send Overtex Qoatlus to his Graveyard. He used Qoatlus’s effect to add Double Evolution Pill from his Deck to his hand. Next, he activated Gold Sarcophagus to banish Thunder Dragondark from his Deck, and used Dragondark’s effect to add Thunder Dragonhawk to his hand. He discarded Dragonhawk to Special Summon Dragondark in Attack Position and then used Double Evolution Pill. He banished Qoatlus and Dragonhawk from his Graveyard to Special Summon Ultimate Conductor Tyranno from his Deck and then Tributed the Dragondark to Special Summon Thunder Dragon Colossus in Defense Position. Ramirez opened up with Cyber Dragon, One for One, Overload Fusion, Book of Eclipse, Cyber Emergency, and Cyber Dragon Herz. He Special Summoned Cyber Dragon and Hunter used the effect of his Tyranno to “try” to destroy his own Colossus. He then protected Colossus with its effect by banishing Dragondark from his Graveyard. Since Colossus was protected, Cyber Dragon remained face-up on the field. Hunter added Dragonroar to his hand with the effect of the banished Dragondark. Ramirez fused his own Cyber Dragon with Thunder Dragon Colossus to Summon a Chimeratech Megafleet Dragon with 2400 ATK and then activated Cyber Emergency; but Hunter negated it with Ash Blossom & Joyous Spring! Ramirez activated One for One next, sending Cyber Dragon Herz to the Graveyard to Special Summon another Herz from his Deck. He used the effect of the Herz he sent to the Graveyard to add a Cyber Dragon from his Deck to his hand and then combined Megafleet with Herz to Link Summon Cyber Dragon Sieger. Next, he activated Overload Fusion! He banished Herz and Cyber Dragon from his Graveyard to Special Summon Chimeratech Rampage Dragon and used its effect to try to destroy Hunter’s 2 face-down cards; but Hunter Chained Infinite Impermanence to negate the Rampage Dragon’s effect. Ramirez attacked Ultimate Conductor Tyranno in the Battle Phase and used Sieger’s effect to so that he could destroy the Tyranno in battle. Then Rampage Dragon attacked directly, dropping Hunter down to 5900 Life Points. Ramirez Set Book of Eclipse before ending his turn. Hunter discarded Thunder Dragonroar from his hand to return Dragonhawk from his Banished Zone to his hand. Then he discarded Dragonhawk to Special Summon Dragondark. He Normal Summoned Souleating Oviraptor next, and used its effect to add Giant Rex from his Deck to his hand. He combined Dragondark with Oviraptor to Link Summon Wee Witch’s Apprentice and used his Dragondark’s effect to add Thunder Dragon Fusion from his Deck to his hand. He activated it, sending Dragonroar, Colossus, and Dragonhawk back to his Deck to Special Summon Thunder Dragon Titan to his field. He attacked Sieger with Titan. With Wee Witch’s Apprentice’s effect active, Sieger’s ATK was under 2100, so he couldn’t use Sieger’s effect. Instead, he flipped Book of Eclipse to put Titan and his own Rampage Dragon face-down. Wee Witch’s Apprentice attacked and destroyed Sieger. In the End Phase, Titan flipped face-up and Hunter drew a card due to the effect of Book of Eclipse. Ramirez flipped up Chimeratech Rampage Dragon and used its effect to send Core and Herz from his Deck to his Graveyard. He used Herz’s effect to add Core to his hand and then Normal Summoned Cyber Dragon Core. He used Core’s effect to add Cyber Revsystem to his hand. He activated Cyber Revsystem next, Special Summoning Cyber Dragon from his hand. He combined Cyber Dragon with Rampage Dragon to Xyz Summon Cyber Dragon Nova and used Nova’s effect to detach Cyber Dragon from it and Special Summon Sieger to his Main Monster Zone. He then fused his Core with Wee Witch’s Apprentice to Special Summon Chimeratech Megafleet Dragon Linked to Sieger and entered his Battle Phase. He used Sieger’s effect to double its ATK and destroy Titan, and then attacked directly with Nova and Megafleet, dropping Hunter down to 1400 Life Points. In Main Phase 2, he upgraded his Nova into Cyber Dragon Infinity and ended his turn. Hunter banished Thunder Dragon Fusion from his Graveyard to add Thunder Dragonhawk from his Deck to his hand and then discarded the Dragonhawk to Special Summon Thunder Dragondark to his field. He Tributed the Dragondark to Special Summon Thunder Dragon Colossus from his Extra Deck in Defense Position. He tried to use Dragondark’s effect, but lost out to the effect of Cyber Dragon Infinity. Next, Hunter banished Dragonroar from his Deck with Gold Sarcophagus and used its effect to Special Summon Dragonroar from his Deck. He sent Dragondark and Colossus to the Graveyard to Link Summon Some Summer Summoner and then Set Gem-Knight Amber. He sent Amber to the Graveyard to Special Summon Thunder Dragon Colossus and then Tributed the Summoner to Summon another Colossus. One of them attacked Sieger, and Ramirez used Sieger’s effect to double its ATK and win the battle. Hunter protected the Colossus by banishing a monster from his Graveyard. Then, the other Colossus attacked and destroyed Infinity. Ramirez drew Ash Blossom & Joyous Spring and then activated Cyberload Fusion! 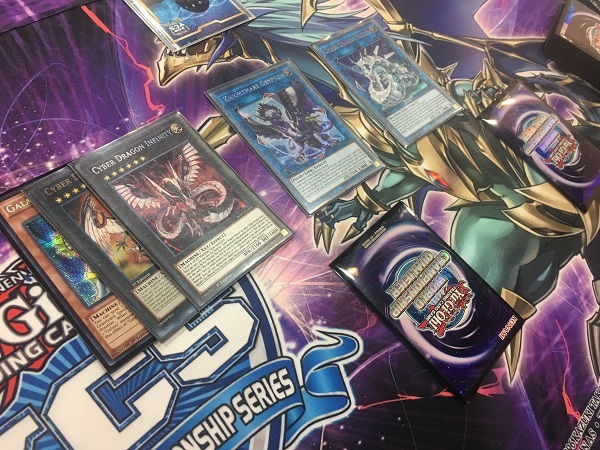 He Special Summoned Chimeratech Rampage Dragon and then used its effect to send Cyber Dragon Core and Cyber Dragon Herz from his Deck to his Graveyard. He used Herz’s effect to add Core to his hand and then ended his turn. Hunter drew a card and then time in the round was called! Ramirez was up 7800 Life Points to 1400 Life Points, so Ramirez was declared the winner of the Duel! Since he had also won the first Duel, Ramirez was declared the winner of the Match! 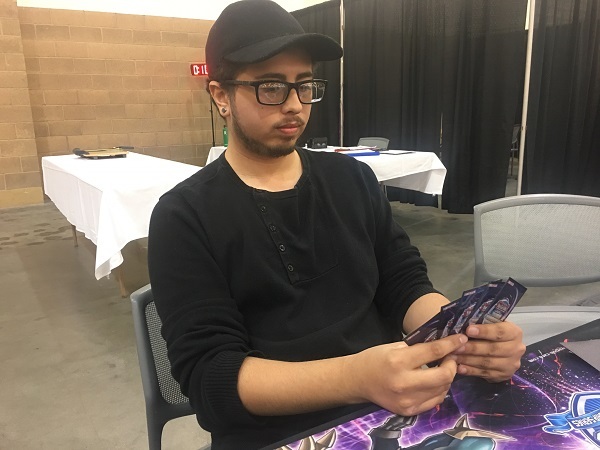 Brian Ramirez and his Cyber Dragon Deck are moving on to the Top 8! 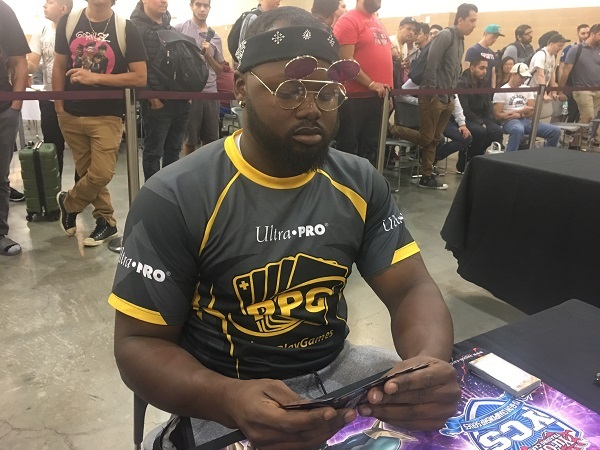 YCS Pasadena: Top 8 Pairings and Deck Breakdown YCS Pasadena: Top 16 Players and Decks!